Are you looking for a job? Workforce1 can help you find and prepare for the job you want. Whether you are unemployed, hoping to make a mid-career change, or looking for your first job, Workforce1 Career Centers in each of the 5 boroughs offer a number of services. Workforce1 Career Centers are a partnership of agencies and organizations working together to provide a full array of free job training, recruitment, and placement services. We’ve teamed with employers of all sizes in the five boroughs who are committed to hiring local residents. 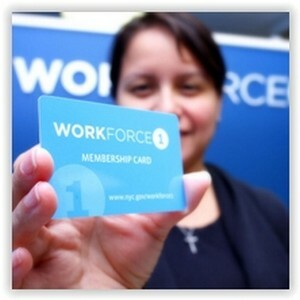 Thousands of New Yorkers have already used Workforce1 to start new careers. We can help you look for a job as soon as you’re ready to move ahead in the field of your choice. Using a Workforce1 Career Center is easy. Simply come in for an orientation to learn more about the services available to you.